Despite the surge of anti-Arab sentiment following the recent terrorist attacks, advocates for Syrian refugees are redoubling their efforts. Syrians in the United States may be safe from falling bombs, but they are never free of the shadow cast by the still-raging war. 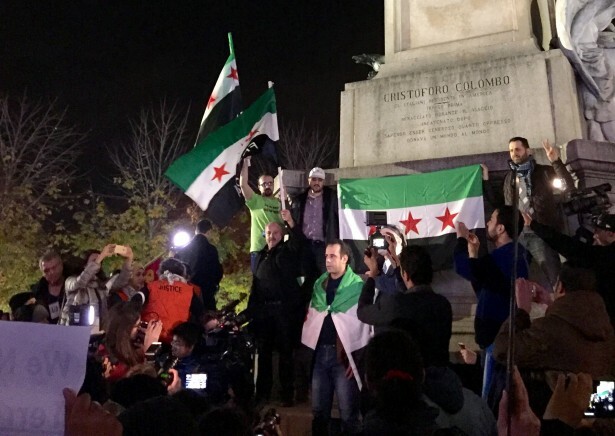 Sarab al-Jijakli is one of many Syrians in America who have sought activism as an antidote to the frustration and grief of watching their nation torn apart by fighting. But, as al-Jijakli says, this can often feel like an exercise in futility. “There’s a chant on the Syrian streets now — that we have no one to rely on but God,” said al-Jijakli with a mirthless chuckle. “It’s really starting to feel true.” His comment came in late November 2015, and reflected a deep weariness wrought after years of struggling for the Syrian cause. That all began to change in the summer of 2015. I first met Sarab al-Jijakli on a cloudy morning on September 18, 2015, in Manhattan’s bustling Union Square. Despite sprinkling rain, al-Jijakli’s spirits were high as he ambled through the crowd of 200 activists and onlookers gathered in the plaza. Al-Jijakli conferred with fellow organizers and passed out signs emblazoned with antiwar slogans and “Welcome Refugee” messaging. 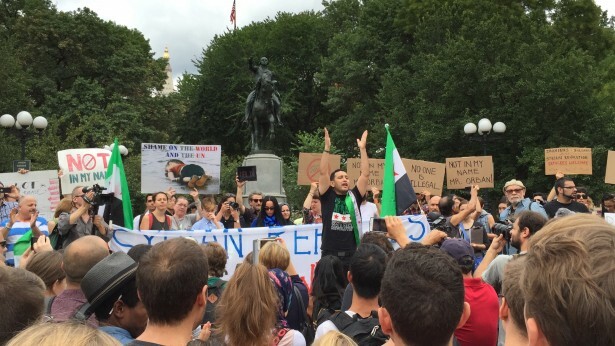 At noon, al-Jijakli mounted the plaza steps to lead the first major pro-Syrian refugee rally in New York City. Turning to me a few minutes before his opening speech, al-Jijakli’s earnest eyes showed a long-absent glimmer of optimism. “People are starting to care about the Syrian plight,” he told me. At the time, he was right — American public opinion in September 2015 showed unprecedented support for resettling Syrian refugees in the United States. This trend, while heartening, represented a belated reaction to a tragic reality. Throughout the summer of 2015, as images of overcrowded lifeboats, squalid squatters camps, and the unforgettable photograph of young Alan al-Kurdi’s limp body penetrated Western media, Americans felt a sudden concern for the years-old conflict. Looking to European nations like Germany and Sweden as examples, Americans began to call on their own government to take a more proactive approach to alleviate the humanitarian crisis. Many of those gathered in Union Square that morning were newcomers to political activism and to the cause of the Syrian refugees. Al-Jijakli opened the rally by rattling off a few of the grisly facts: Since 2011, a quarter-million Syrians had died, 7 million were internally displaced, and 4 million refugees had been driven out of the country. Despite the magnitude of the crisis, al-Jijakli reminded the crowd that the United States had so far accepted fewer than 2,000 refugees for resettlement. The crowd booed at this disheartening statistic, with chants of “Let them in!” swelling from their throats. Another dedicated Syrian activist, Hamid Imam, took the stage next, launching into a passionate call for an end to the “proxy war” in Syria and a toppling of the Assad regime. Young and fiery, Imam is tormented by the memory of his hometown, Raqqa, which is now an ISIS stronghold wasted by months of fighting. That morning, his voice rang with urgency. “Our people have suffered every kind of violence — bombs, bullets, beheadings.” Imam paced around the platform in tight circles, his thick arms waving up and down as his upper body rocked in rhythm with his words. “What more does the world need to see before they put a stop to this?” Imam ended his speech with a return to al-Jijakli’s call for more refugees to be resettled in the United States. Later, on October 12, al-Jijakli stood before a packed meeting hall at the Islamic Center of NYU, where over a hundred community members from the tri-state area had gathered to strategize about the next steps in pro-refugee advocacy. Alongside al-Jijakli were representatives from the International Rescue Commission and Islamic Relief, as well as Linda Sarsour, a prominent activist and founder of the Arab American Association of New York. Barely a month later, the world watched in horror as Paris was plunged into bloody chaos. As the horrific events unfolded, al-Jijakli steeled himself for possible fallout against his community. “I was thinking what every Muslim was thinking: Please, God, don’t let the attackers be Muslim.” When a Syrian passport surfaced at one crime scene and the so-called Islamic State claimed responsibility for the carnage, al-Jijakli’s grief was compounded with the dread of impending backlash. Within hours, al-Jijakli would begin to see months’ of advocacy work undone, as anti-Arab sentiment surged across the country. Politicians, formerly vocal supporters of the proposed refugee resettlement, now competed in denouncing the plan with increasingly vitriolic rhetoric. Within days of the attacks, 31 state governors announced their plans to refuse Syrian refugees, reneging on earlier promises and denouncing these asylum seekers as a collective security threat. “I will not stand complicit to a policy that places the citizens of Alabama in harm’s way. We refuse Syrian refugees,” tweeted Alabama Gov. Bentley. House Speaker Paul Ryan urged Congress to pass a bill barring both Syrian and Iraqi refugees, arguing, “This is urgent. We cannot and should not wait to act, not when our national security is at stake.” When activists, and Obama himself, pointed out that refugees receive more intensive screening than any other demographic entering the United States, it did little to stem the anti-Syrian hysteria. In the weeks following the Paris attacks, it appeared the storm was growing darker. When it was revealed that the couple responsible for the subsequent San Bernardino attacks had ties to ISIS, Islamophobic and anti-Arab rhetoric mounted across the country. The hysteria came to a head on Dec. 6, when presidential candidate Donald Trump made a public call for a nationwide ban on Muslims entering the country. Meanwhile, reports of attacks on Muslims across the United States continued to rise. It was not long, however, before Imam and al-Jijakli redoubled their efforts, joining forces with Linda Sarsour and a wide coalition of activist groups in the tri-state area to organize another rally — this one in front of Donald Trump’s own property in Midtown Manhattan. On Dec. 10, over 700 individuals representing over 50 organizations gathered in Columbus Circle, just off of Trump’s looming high-rise properties, and for an hour and half filled the air with their adamant voices. With supporters ranging from leather-clad CUNY students to Spanish-speaking Brooklynites to Asian-American organizers from the Bronx, the rally was bigger and broader than the Union Square gathering — and angrier, too. “War is terrorism. Refugees are the victims” read one sign, hoisted by a trim, white woman in a wool coat. “Refugees welcome — Trump, not so much” read the poster of a curly-haired man in a skullcap, standing beside a group of antiwar organizers waving “Hands off Syria” signage. Others raised boards emblazoned with Spanish and Arabic messages of solidarity. In the center of the plaza, speakers clambered atop a granite monument to project their voices above the crowd. At the back of the crowd stood Manal Abdelaziz, a demure, Damascus-born mother of three. Speaking in Arabic, she said that while she occasionally faces hostility in the United States, she’s grateful for the opportunity it offers her family. “Really, I’m here [at the rally] to show my support for the people back in Syria.” Abdelaziz said she prays daily for her family, still in harm’s way in Damascus.